The uvea is a vascular, fibrous layer that protects the eye, and is critical to nutrition and gas exchange. 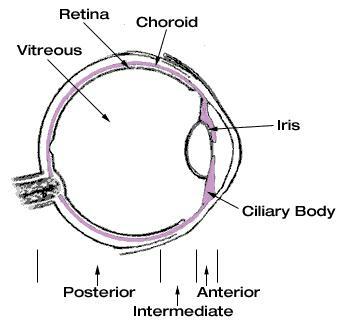 It consists of three parts: the iris, ciliary body, and the choroid. When any part of the uvea becomes inflamed, it is called uveitis. There are three types of uveitis, each affecting different parts of the uvea. Anterior uveitis – The most common form of uveitis (accounting for 40-70% of cases), it affects the iris and its surrounding tissue, the ciliary body. Anterior uveitis is sometimes referred to as iritis because the iris is the part of the uvea that is usually inflamed. Intermediate uveitis – Another form of uveitis, it affects the area just behind the ciliary body (pars plana) and also the most forward edge of the retina. This is the least common type of uveitis. Posterior uveitis – A rare form of the disorder that affects the back part of the eye, the choroid, and can affect the retina and/or optic nerve. This form is more difficult to treat, and is often associated with progressive loss of vision. In most cases, there is no apparent underlying cause for uveitis. It is a condition associated with a wide spectrum of diseases and syndromes, and may also come as a result of the body’s natural response to infection. In roughly half of anterior uveitis cases, there is no association found with other diseases. These cases may occur as a result of trauma to the eye. Prescription eye drops in combination with anti-inflammatory medications. Eye drops may not penetrate well to the back of the eye, so this type of treatment isn’t efficacious in posterior uveitis. Periocular steroid injections – this form of therapy may be uncomfortable, yet very effective in acute episodes of uveitis. Systemic or oral administration of steroids, other immunosuppressant or anti-metabolite drugs. The dose required to penetrate and treat uveitis in the eye is frequently associated with side effects in the rest of the body (including Cushing's syndrome, renal, liver and bone-marrow damage).